I had no sailing experience coming into this. I was nervous I’d be lost in class and hate sailing. Jack’s calm and patient attitude was encouraging, and I learned a lot! 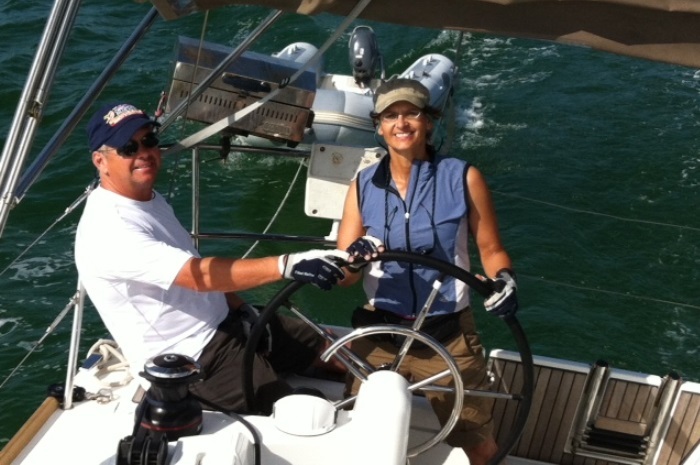 I feel confident that my husband and I can charter a boat and enjoy sailing! Jack Yaeger is wonderful. It can’t be easy dealing with different personalities and levels of ability, but he can get along with anyone! He never raised his voice or seemed nervous. That helped me stay confident and I learned a lot from him. The overall experience was outstanding. Both instructors were very knowledgeable and always had clear and concise answers. Jack was calm on the water at all times, even when we potentially made an error. 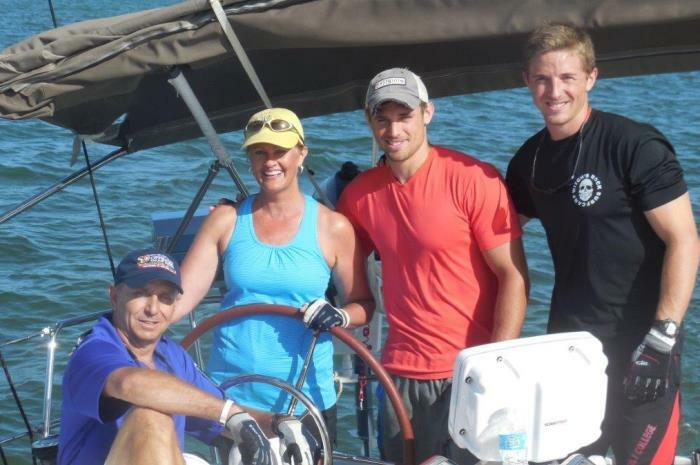 We had the opportunity to sail in 30 knot winds and Jack was calm and allowed us all together to participate. That was a blast. The class material and tests were thorough and forced us to study and practice. Based on our collective performance it was worth it. 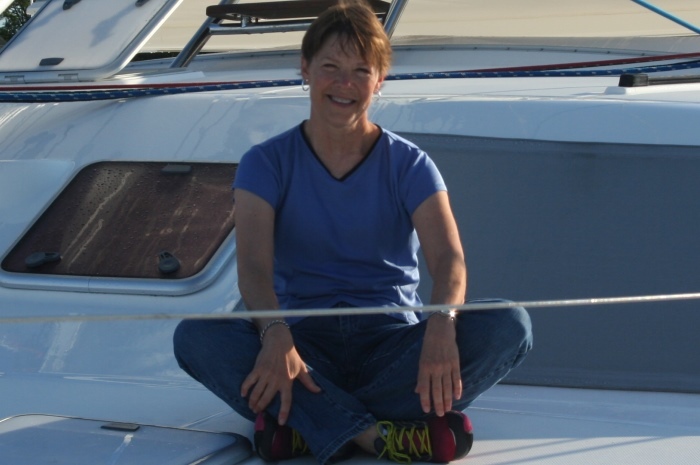 We all felt comfortable on our solo sail and would not have if we hadn’t been prepared!! Tom wrote: Thoroughly enjoyed the week. Learned a lot and had a good time with our instructor, Joelle! She was patient, clear, always took time to ensure everyone was comfortable, and answered questions thoughtfully. 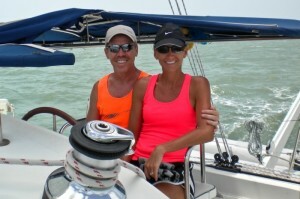 Would enjoy sailing with Joelle again in the future. Rachel wrote: I was very apprehensive beforehand and felt like there was so much information to take in while reading the books. I feel much more confident after the week and would feel happy to take out a small boat (eg. Laser) on my own, and look forward to chartering with my husband. Joelle was great – she made me feel like I could do it and she took more time with me to go over things when I needed it. She instilled great confidence and I felt really comfortable with her. I am so glad that she was our teacher, thanks Joelle! Tucker wrote: Had so much fun! Never thought I could enjoy a vacation this much but I was wrong! 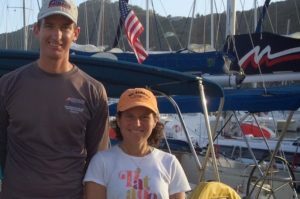 Jane wrote: We came to class with no prior sailing experience and left with 3 certifications, a new vocabulary and a new friend. 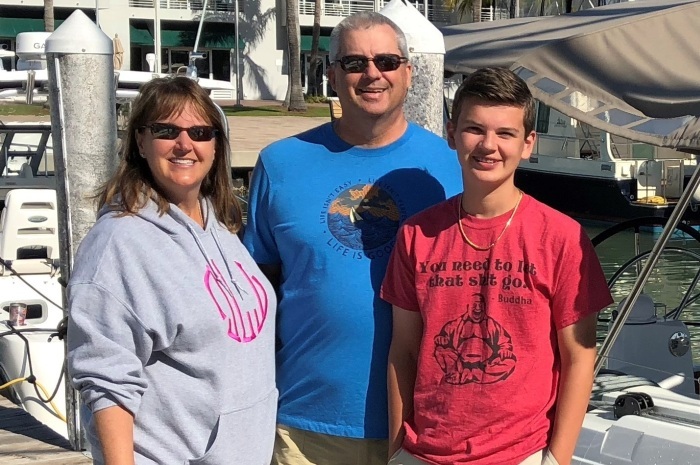 What a wonderful experience for our family of 3 to learn and cruise together! I highly recommend Fast Track to Bareboat Cruising! Tim wrote: Excellent experience. This week has created an unforgettable memory for me and my family. Best “vacation” ever. This experience has changed my life. Cheyenne was excellent. 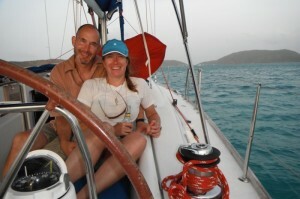 Very patient, we were completely new to sailing and in a week we felt very comfortable with all aspects. 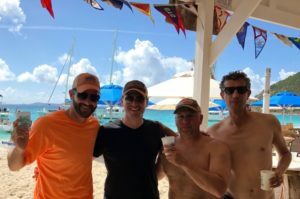 Down in the BVI right now and we just finished our weekend course and are now, on our 44-foot catamaran and getting ready to head out tomorrow for a week of sailing. So far, it has been absolutely amazing and has exceeded everything I could have hoped for. Our instructor is incredible and he truly wants us to know how, and most importantly “why” we need to do things a certain way. Hands down, one of the most rewarding training experiences I’ve ever had!!! 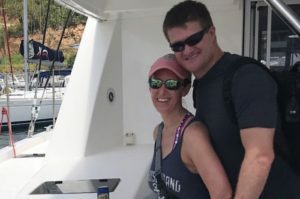 My wife and I had an unbelievable experience learning to sail with Offshore. We both had zero prior experience. 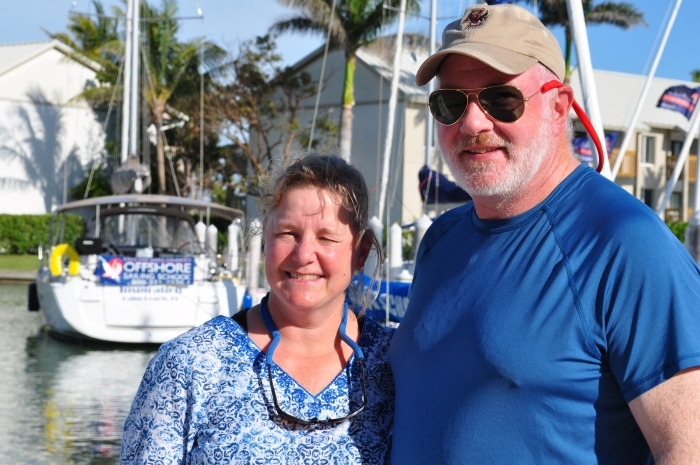 Both of our instructors had decades of sailing and instructing knowledge. They imparted both competence and confidence on the water. We look forward to chartering a catamaran in the Mediterranean next year and ultimately living aboard our own boat someday. We would both high recommend Offshore to anyone. Never thought that I would feel confident driving a 48’ sailing catamaran after a week of training. I understand that there is still a lot to learn, but I will be confident enough to start chartering a boat now. Cheyenne was a pleasure to work with, clam and confident and very knowledgeable. I was very apprehensive coming into the course. The knowledge of the instructors, materials and practical experience took away my anxiety and made me feel like a sailor! I can’t believe the various things you need to know from sailing, mechanic, navigator, electrician, etc. Both instructors were excellent! Very respectful, encouraging and excellent knowledge. Excellent all around! do feel ready to Bareboat Charter. 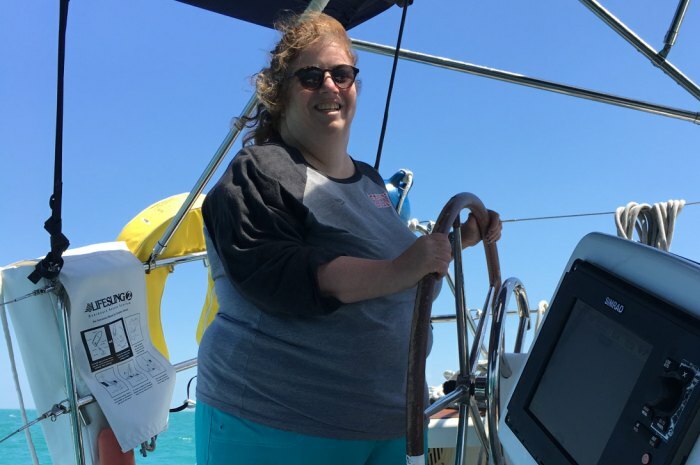 Great experience learning to sail and basic cruising. Very good reading material and well complemented by instructor’s teaching. It was fun. Second course with Offshore Sailing School and both experiences have been great, fun with lots of learning. Instructor very courteous and patient. Explained very well sailing do’s and don’ts. Extremely patient with docking procedures and anchoring. Well done. Couldn’t have asked for a better instructor and overall experience. I went from feeling unsteady to start to feeling confident behind the helm o a 43’ boat – pretty cool. Combination of books, instruction and practical experience reinforced the skills. 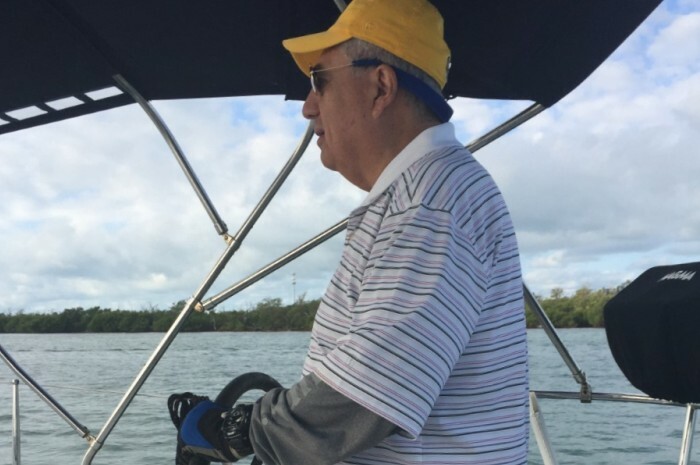 Hunter was beyond fantastic – like having an extremely knowledgeable and patient friend show you how to sail. Extremely levelheaded and cool under pressure, patient and knowledgeable about sailing and the onboard systems. This course was exactly what I expected and wanted; a good refresher on Basic Keelboat. Fast Track to Live aboard Cruising has given me the knowledge and humility to handle my new boat. Our instructor, Hunter Botto, was exceptional! Clear, concise, patient. Thoroughly knowledgeable; practical and theory. Wonderful to spend time with. Enthusiastic and patient. Made it effortless learning. My wife and I were at different sailing experience levels. We wanted to take the Fast Track to Cruising course together and we were not sure what to expect. We were pleasantly surprised with the entire program. Our instructors, Joelle and Mike, were excellent and Katie in the office make sure everything was well coordinated. We were also surprised to meet Doris and Steve Colgate and the personal interest they took in our experience. Joelle and Mike were awesome! Very patient and really took interest in our success. Both also went out of their way to make sure everyone was comfortable and safe. I wanted to write to thank you for all you did in setting up my trip. It ended up being a wonderful experience aboard the big catamaran. My instructor, Amanda, was extremely professional in all her teaching and guidance, and made the trip very pleasurable. 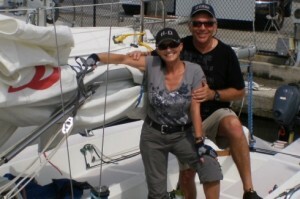 She was very instructive and patient, and did a great job in giving me confidence to sail. I have now booked my first charter to take my family and friends to BVI this May. My hat is off to all those people in your organization who have put together such a phenomenal program. It is no wonder you claim to be the #1 Sailing School in the World! 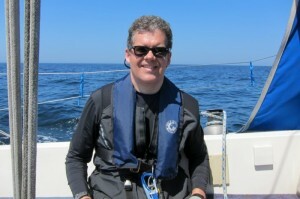 Paul wrote: Overall a most enjoyable experience made all the more relaxing and fun with Brian. He created an atmosphere of calm and peaceful so as to lay the groundwork for the most learning possible. Great! Brian is an excellent instructor, clear, concise, patient, engaging, knowledgeable and a pleasure to be around. He is a credit to your school and as good as it gets for learning to sail. Christine wrote: The organization of the course in general was a fantastic experience. It was so enjoyable to learn so much and have so much fun doing it. Brian is a professional, knowledgeable instructor. His personality for this environment was perfect, with a warm and patient attitude. Both of my instructors, Brian (in the photo with me) on the Colgate, and Dutch on the live-aboard portion of my course, were excellent. 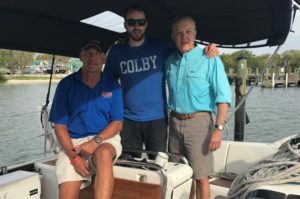 They were calm, patient, and full of sailing wisdom that they imparted all throughout the experience so that the ideas being conveyed were always clear, relevant to the task at hand and became second nature by the end of the 8 days. Fantastic experience. Exceeded all expectations! I am a dedicated lifelong learner. I try to study something every day. So when I say that your Fast Track to Catamaran Bareboat Charter Cruising course is exceptional, I am comparing it to a lot of past courses. 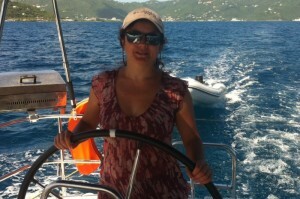 Sailing the Colgate 26 and a 46 foot catamaran were both sailing highlights for me. The Colgate 26 sails like a dream and if the lake in front of my home wasn’t so shallow I would quickly satisfy my lust for one. 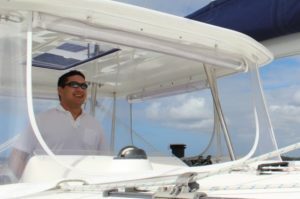 The 46 foot catamaran was very unlike anything I had ever sailed or sailed on. 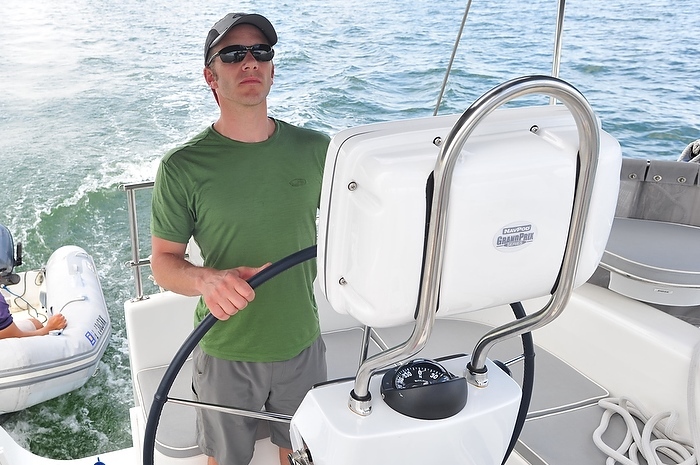 The systems were far more numerous and complex than anything I was familiar with and the boat itself is a lot to handle in the current, tide and wind. 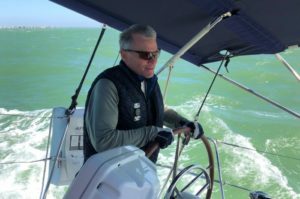 And so, somewhere during the week, it rekindled my interest in sailing into intensely wanting to learn more, charter a big boat in an exotic location and expand my sailing horizons. Finally, the course has not only increased my knowledge and interest in cruising but the enthusiasm has spread to my family, I don’t think that it is a coincidence that the books I received for Christmas were about cruising and another about sailboat cruising in the British Virgin Islands. And this weekend I couldn’t miss the brochure for a sailboat charter company that just happened to be on my daughter’s kitchen table. We all thought Rick did a great job throughout the week, but we were still amazed at the end of the week by how much we had learned. Excellent experience. Looking forward to taking another class. Wow! This course exceeded our expectations in every way. It was challenging, fun, very interesting and has given us more confidence for coastal sailing in Newfoundland this summer. Anyone who is looking for a top-notch, unforgettable, hands-on experience should take this course! Our instructors were Amazing! !They were incredibly patient, encouraging, knowledgeable, positive, helpful, professional and CALM! We loved hearing about their past sailing experiences and sailing stories to use as examples for learning. We were impressed with the variety of teaching techniques used throughout our course to make learning fun and interesting for us both. The Colgate 26 model was invaluable during the classroom instruction. The recommendation to study all the books prior to arrival was essential and enhanced our ability to learn the volume of material. The books were excellent and will remain in our nautical library collection! Provisions were excellent!! Diana was awesome!! Very helpful and we appreciated the prompt replies to our questions and inquiries. Jim has extraordinary patience, even after showing us the same maneuver countless times. His enthusiasm for sailing is obvious and his knowledge is great. His friendliness and cheerfulness made it a pleasure to take the class. It was a huge amount of material, and I am surprised how much I have learned in a short period of time. 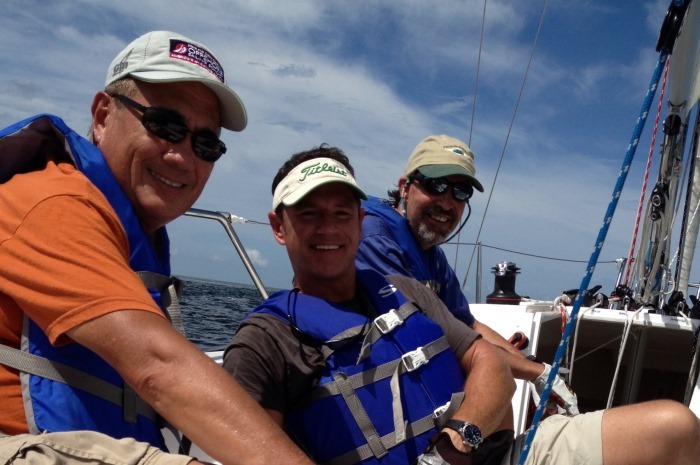 We can’t wait for summertime sailing on the Chesapeake. Thought you guys might like to see the pics and the commentary from our first SOLO voyage with my two rookie sons as crew. 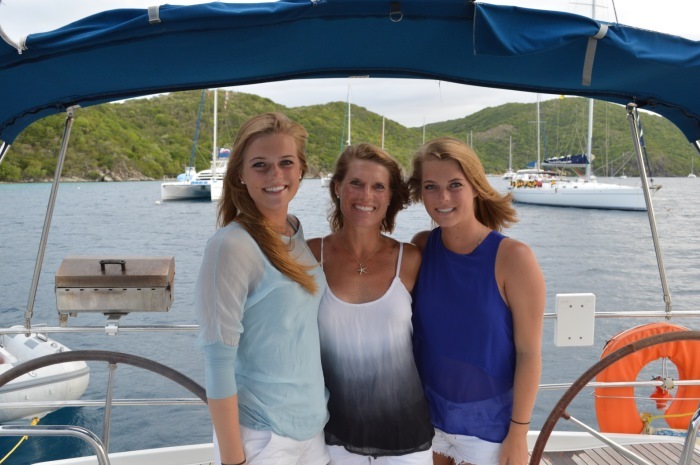 Just came back from the BVI on our maiden voyage on a 44’ catamaran. Very proud of our accomplishment. 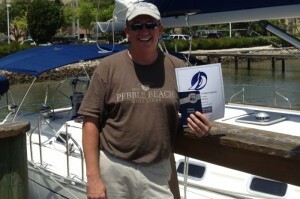 Thanks for all the great training in the Fast Track to Catamaran Cruising Course!! Rick is a practiced and patient professional. He is a pleasure to have met and been taught by. 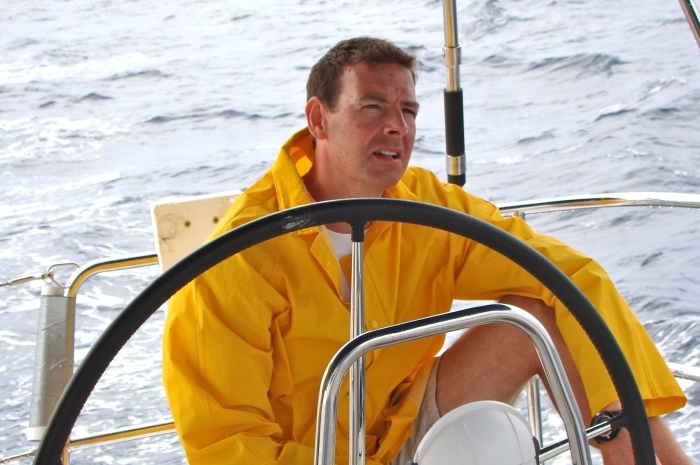 My sailing was made 100% better after being in the tutelage of both him and initially Brad Lowden on the Colgate 26. Everything we encountered has made me more confident of my sailing skills. The food choices were excellent and the quantity good enough to have only a bit left over. The quality of literature is priceless and this well-developed program is truly a blessing. The Jeanneaus are in great shape. A pleasure. Thanks for the memories AND the much needed time at sea!! Lived ashore during Fast Track to Cruising course, very enjoyable. Excellent facilities, leaving with a volume of knowledge and experience. I am signed up for a sailing trip through The Moorings in July, really looking forward to it. Thanks for everything. I’m coming back! Overall experience: Top 10. It takes a lot to rattle my feathers, so I pick my words wisely. I needed to learn so much in a short time. It was a blast. The facility, the people, and most important Garren. His knowledge and experience is over the top. Both Garren and Rick were excellent instructors. Garren is mature beyond his years and is very patient with slow learners; I would take any course from him. Rick was also very smooth and easily approachable. It was very clear they were experienced sailors. This course greatly exceeded my expectations. 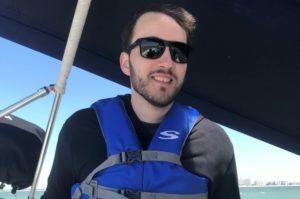 I am very new to sailing, but this experience has opened my mind to a whole new world. 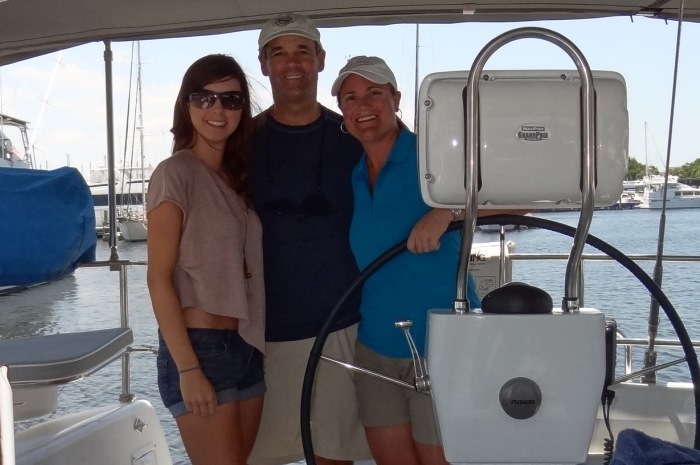 I thank Offshore Sailing for providing a course where I was able to spend some very valuable time with my family. From Karen Snider: Enjoyed both instructors. Mike was very kind, knowledgeable and considerate with correction of technique. Excellent course, much more comfortable with bareboat sailing and now looking forward to bareboat cruising. From Eric Snider: Michael Dewane was very enthusiastic and patient. He was great with helping our kids enjoy the course. Garren Erlenbusch was very patient on the water. He was very kind to our children. Great experience. Rick was a fantastic instructor that was able to answer all of my questions that I had gathered in reading for this course. 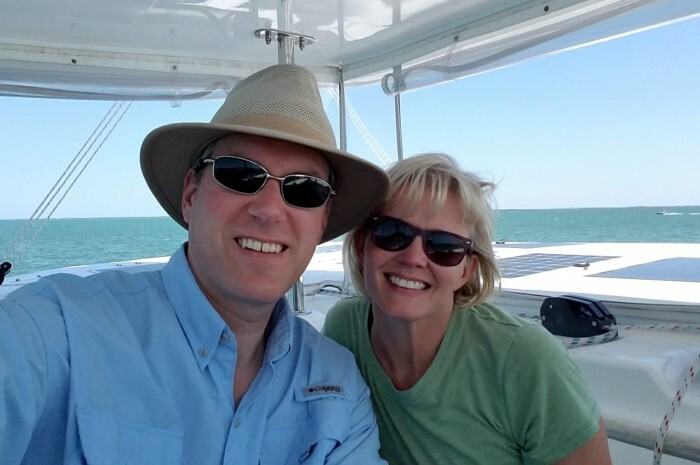 My wife (Sarah) and I are planning on purchasing a boat in the next few years and I feel that this course was a great decision in preparing us to own a boat. 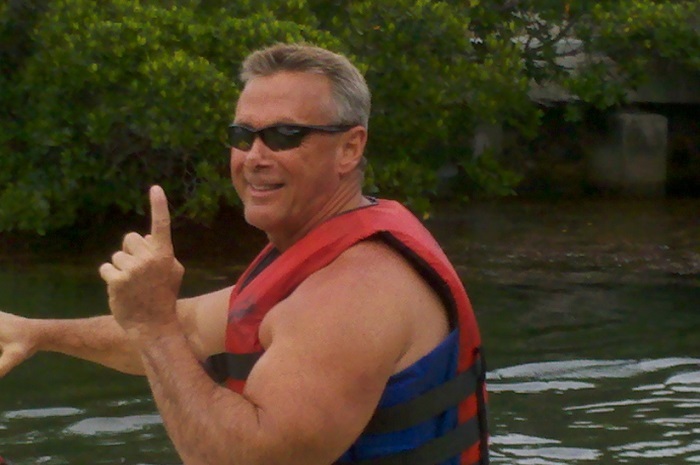 Neil was very knowledgeable and a great instructor. He took our family to the next level. My husband and I have been bareboat chartering for the past 10 years. It was our 17 year old daughters that wanted to get certified. They wanted to ensure that they could sail on their own one day. We took the live aboard as a family and took our knowledge and skills to the next level. We all now know “why” we make each sail adjustment, tack, jibe, etc. Sailing is now a bigger thrill than ever. Folkert was patient and very professional. I would definitely recommend him to other people seeing cruising certification. 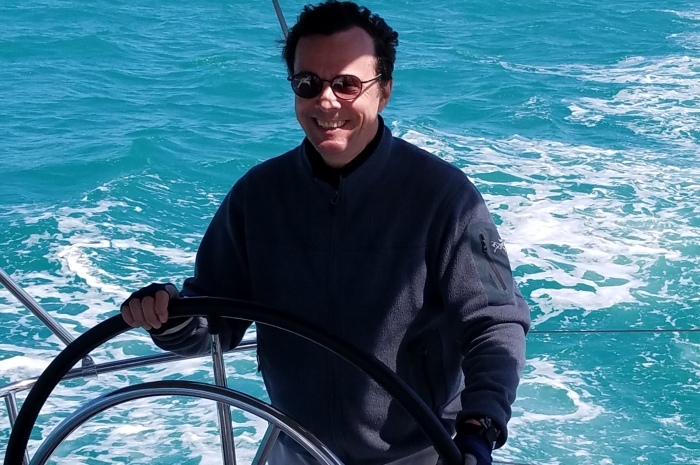 After taking a corporate leadership course with Offshore and following up with my Fast Track to Cruising certification in the British Virgin Islands, I now feel quite comfortable chartering my own bareboat in the Caribbean. Fast Track to Cruising was Great! I want to sail every weekend now. Jason was a very knowledgeable and enthusiastic instructor. Brooke and Jacek were both awesome – we couldn’t have asked for anyone better. Jacek went the extra mile: staying late to ensure we understood the content, helping with “re-provisioning,” and made sure we had everything we needed to have the best experience possible. Overall it was an amazing experience. My fears of sailing Spartina w/o an instructor quickly faded as the week progressed. Although nothing beats experience, I feel like I now have a solid foundation for chartering bareboat cruisers in the future. Thank you Offshore Sailing School! Our instructor was amazing! Patient, kind, supportive, inspiring . 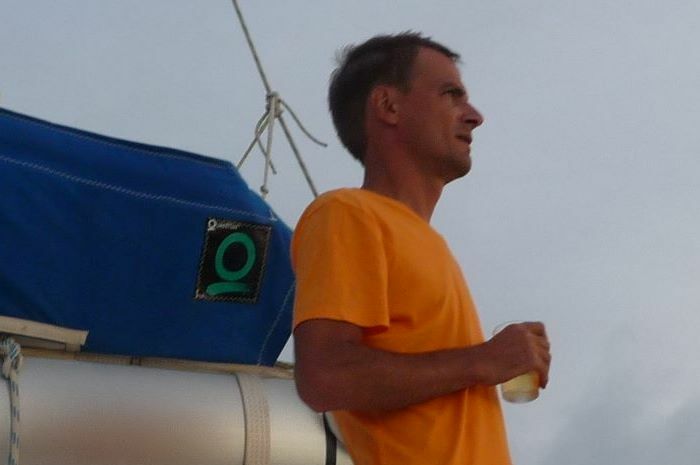 . . his sailing/cruising knowledge and experience were invaluable. It would be an honor to sail with him again. 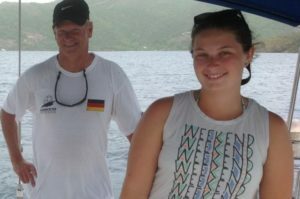 Offshore Sailing offered quality classes that both reviewed and challenged my husband and I. Tortola is a dream location with breezy wind, warm sun and stunning vistas. Can’t wait for our next class!! 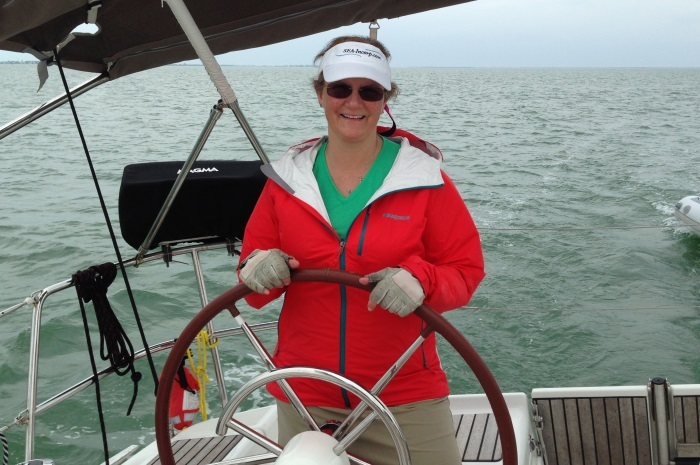 I had a great time in St. Petersburg at the Keelboat/Cruising course. Everything was perfect from the accommodations, weather, boat, instructor and classmates. 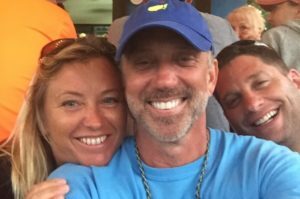 I couldn’t be happier with the experience I had at Offshore Sailing School and want to congratulate you on a superbly run organization. Cory was a great instructor and a fun guy to share a week with. I took the course expecting an overview of sailing. 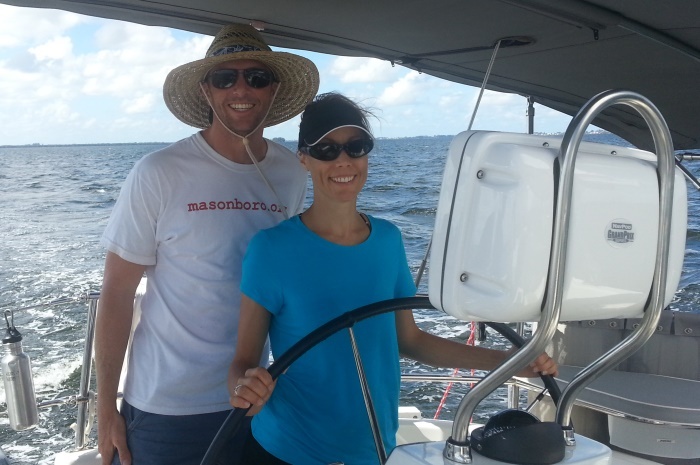 I was surprised to find myself competently handling a 44’ cruiser at the end of just one week. 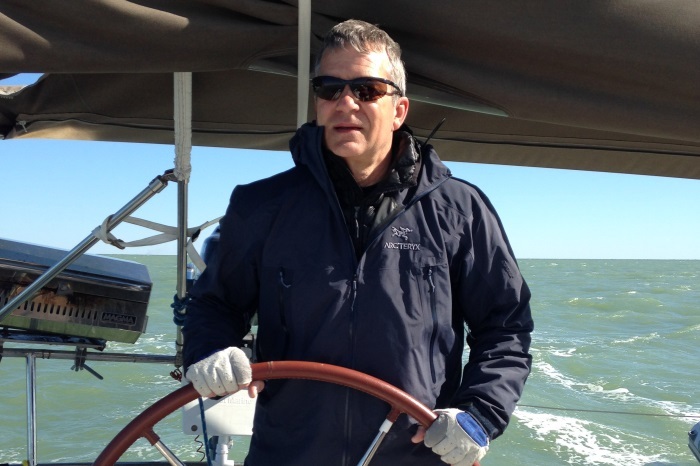 Even having done a lot of sailing I learned a lot during the week. My wife went from novice to knowledgeable and reliable in 1 week, amazing! Brooke and Jacek were both great. Rally enjoyed the time spent with them. The course was awesome! 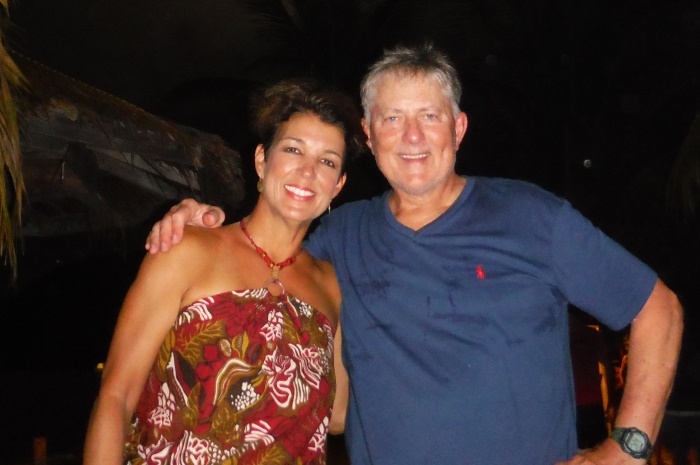 Our two instructors, Louise Reardon and Jason Geyser, are great people and were absolutely wonderful to work with. The accommodations at the Mariner were all we could have hoped for. The staff there was friendly, courteous, and always helpful. We shopped at HiHo, ate at Ginny’s and Charlie’s, and even had a couples massage at the Spa our last night. As for our sailing vessels, the Colgate 26 was everything it was promised to be, and we can’t picture a better way to go through the initial learning experience. 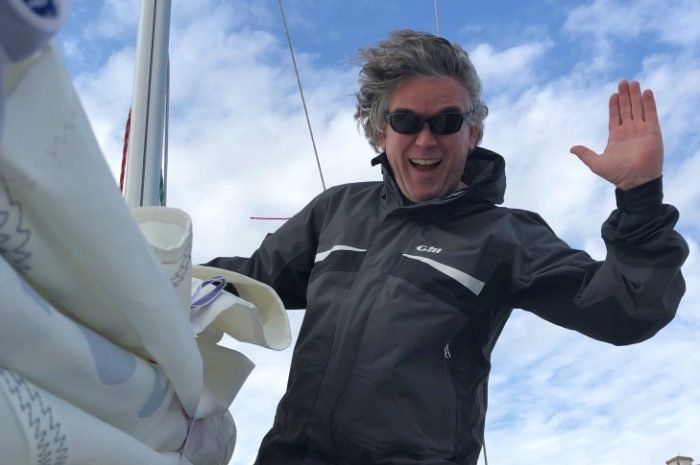 The “jump” to the Beneteau 41 was the right choice and also a great learning experience for us. The boat was clean, in great condition, and everything we could have hoped for. Instructors could not have been any better. Hotel, boats, classrooms were all in perfect condition. I had a basic understanding of sailing, but now I feel so cocky about my sailing. I feel so valid and legit: like I could sail anything. Instructors were very professional. Offshore Sailing School by far exceeded my expectations. I’m not only prepared now to sail the BVI’s in June, but more capable of sailing more effectively and efficiently at my home club. Fantastic program Mr. and Mrs. Colgate! I’ll be back for round 2. It was a truly fantastic trip. I loved every single minute of every day. Our instructors were really great. Very knowledgeable. I learned a lot. The other people in the group were very nice. There was a really good atmosphere in the group every day. So at the same time we were learning, we had a lot of fun. 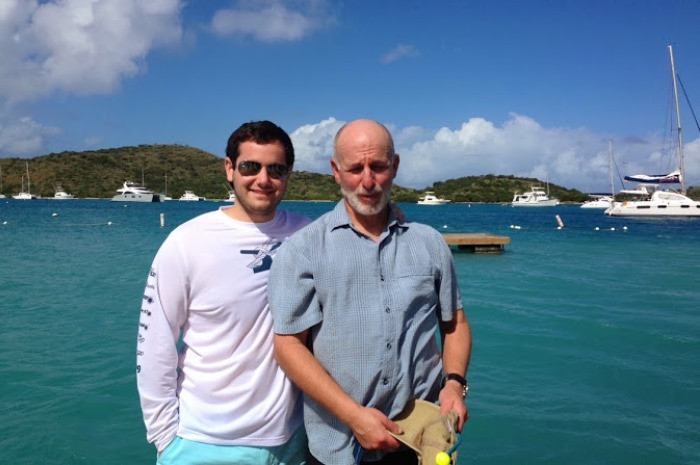 My son and I enrolled in the Fast Track to Cruising course out of Tortola. 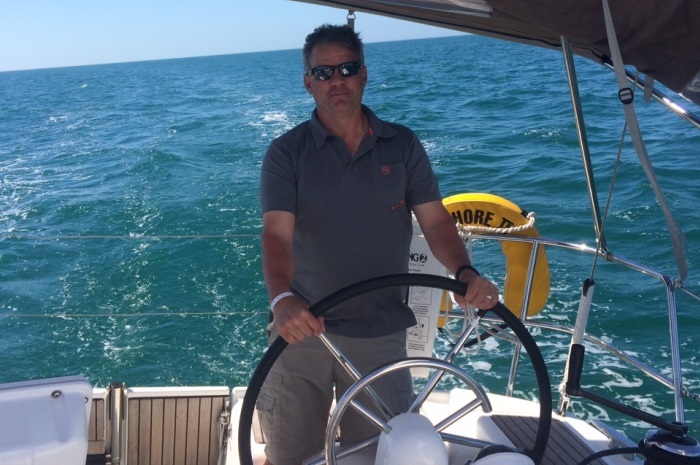 We were hoping to gain a solid familiarity with bareboat cruising to enable future charters. Our instructor, Maria Powell, was so exceptional in the way she taught and reinforced the necessary skills. The entire experience far surpassed our expectations. 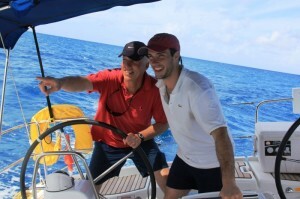 We would adamantly recommend the Offshore Sailing School to anyone wanting to seriously develop their skills. I went from a novice, wondering if sailing was for me to a sailing enthusiast – comfortable with a large boat – in one short week. Amazing how fast it all came together, can’t wait to sail again. I knew when I completed the Fast Track to Cruising course I had walked away with obvious knowledge, visible improvement in my skills, and a boost to my confidence. Now that our 19 ft daysailer is back in the water, I even more fully realize the great benefits of the course. On our own, we had calm and clear communications and helped each other troubleshoot all day. We braved 20-24 knot winds with gusts up to 30 knots on a lake with 1-2 ft waves. We reefed the main, furled the jib part way, and had a smooth and steady sail. We were able to heave-to in those conditions and felt confident and secure about our actions!! We shot a narrows using charts and GPS, and we handled a VERY narrow channel near a dam with ease. We had never before been able to accomplish those feats!! 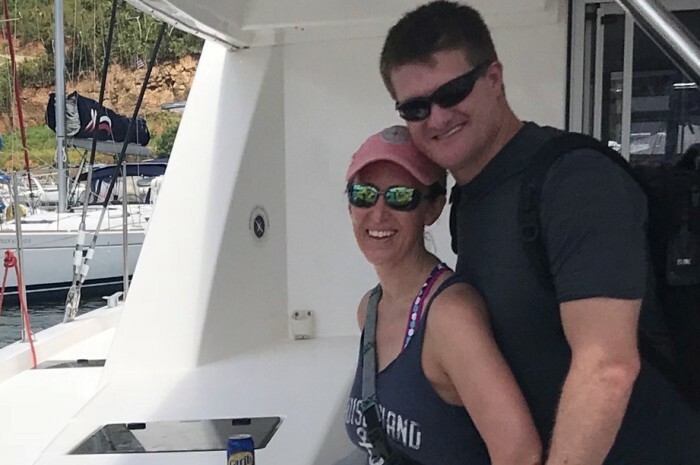 Thank you for making our time on the water in the boat of our dreams even more enjoyable than we thought possible! It is those ‘Ah-Ha!’ moments months after the course, to know that you totally retained all the material and everything seems to just click into place. Thank you all for what has proven the test of time to be EXCELLENT training!! We do plan to keep up our skills with some advanced coursed down the road. Can’t wait! I would like to thank Offshore again for your great program. Diana Smith really helped pull this learning trip to the BVI together with no worries and Julian Putley and your partners at The Moorings made us feel welcome and gave us a great week of instruction that blended education with a passion for the pastime. My dad and I couldn’t have had a more productive and enjoyable adventure. 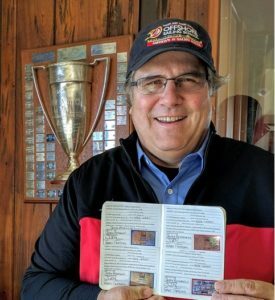 My thanks to you all! 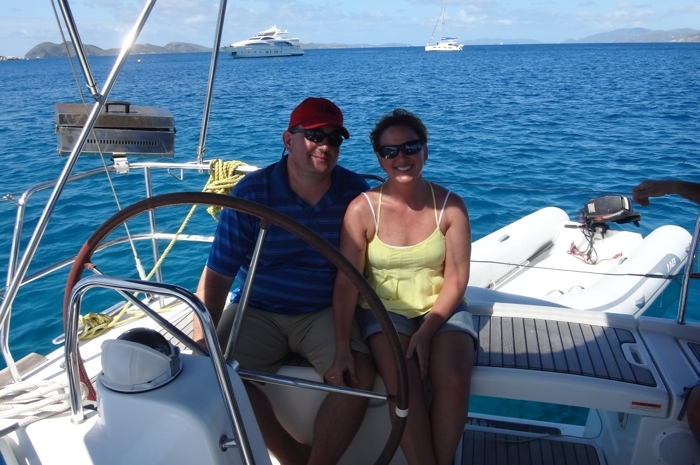 My wife and I had an absolutely wonderful experience in the Fast Track to Cruising class in the BVIs. The instructors were all excellent – extremely knowledgeable and patient. 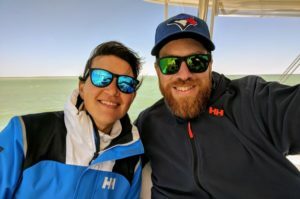 I had some small boat experience and my wife was a complete novice, but we’re now comfortable and excited to take our first bareboat charter on our own. Our instructor Brian was great. His patience level was fantastic and he made the experience a low stress environment. Would highly recommend this to anybody looking to bareboat in the future. What a fantastic experience! 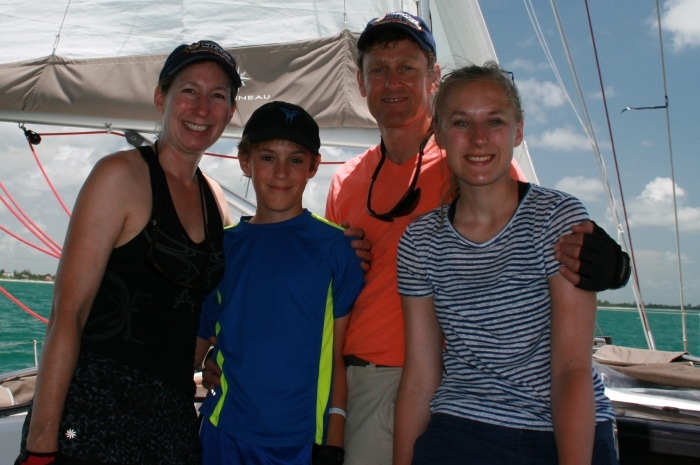 Our Fast Track week on the catamaran was fun and educational from beginning to end. We can’t say enough good things about our instructors. They were excellent coaches with just the right combination of professionalism and friendliness. They helped us gain the confidence we were looking for and we are thrilled with what we learned. There will definitely be more sailing adventures with Offshore Sailing School in our future. 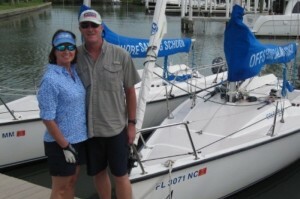 Less than one year ago, we purchased our very 1st sail boat. We had never sailed before. We enrolled with the Offshore Sailing School last spring to learn as much as we could about sailing before launching the “Norwester” in our Canadian waters. 5 months later, we crossed the Northumberland Strait between N.B and P.E.I. Canada. It was a very enjoyable trip, and felt much empowered. At no time did we feel overwhelmed or unsafe during our crossing. 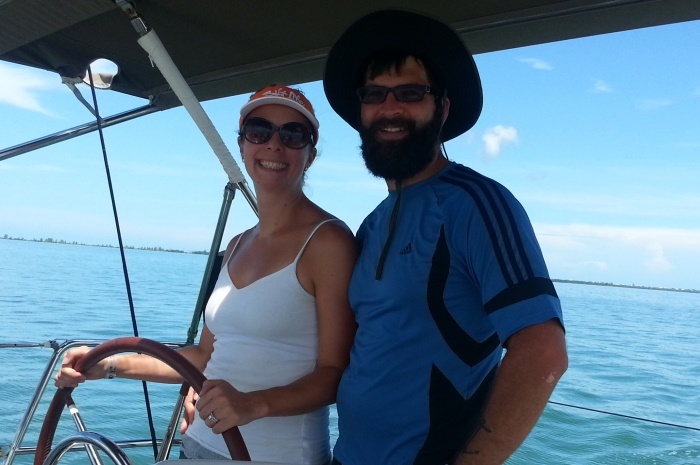 It was our first crossing or long trip on a sailboat. The name of our instructor, Cory Crowner from the Offshore Sailing School in St Petersburg came up a few times during our crossing. One of the things he said that stayed with us was: “It’s just weather,” when he spoke about weather helm, trimming, rough seas, storms, etc. 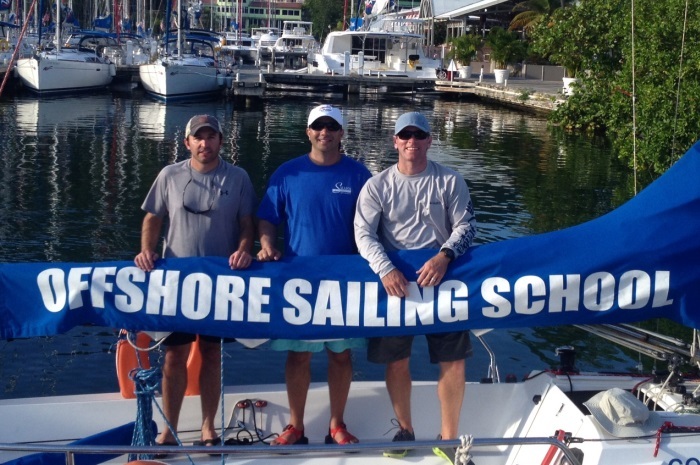 Thank you Corey and Offshore Sailing School.